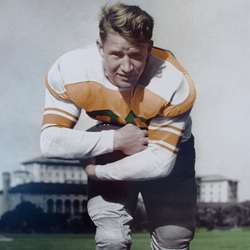 One of the greatest players of the early years of Miami Hurricanes football, John Noppenberg distinguished himself on the football field with his power and fearlessness. Nicknamed "The Mad Bull", Noppenberg earned his reputation for toughness by seeking out opposing tacklers to punish as he ran with the ball from his fullback position. His 55-yard run against heavily favored Texas Tech in a 19-0 win in 1939 was described as one of the most brilliant plays seen in the early years of the Orange Bowl stadium and his game-winning touchdown in that contest was billed "the most important touchdown of the season". Noppenberg's 1939 performance earned the acclaim of his teammates, who honored him with the Frank O. Spain Award for the team's most valuable player. He also earned a spot on that season's All-Florida Team and the All-Southeast Team. A versatile player of the single-platoon era, Noppenberg played halfback and fullback for the NFL's Pittsburgh Steelers in 1940 and 1941, also seeing some action with the Detroit Lions late in the 1941 season. An excellent all-around player, Noppenberg set school records at UM for yards gained by a fullback and earned special distinction for his punting prowess.